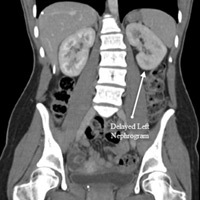 A 19-year-old woman with a past medical history of Dandy-Walker syndrome (with a ventriculoperitoneal shunt) presented to the emergency department with a four-day history of severe intermittent left flank pain and hematuria. 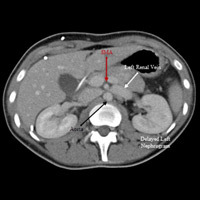 CT of the abdomen and pelvis with IV contrast was obtained and demonstrated extrinsic compression of the left renal vein between the superior mesenteric artery (SMA) and the aorta as the left renal vein crossed midline (Figures A and C). This resulted from an acute angle at the origin of the SMA from the aorta (Figure C). 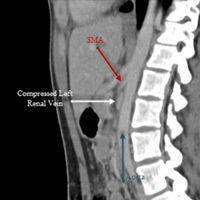 A delayed nephrogram showed a slight delay in excretion of contrast material from the left kidney when compared with the right kidney (Figures A and B). The findings were consistent with nutcracker syndrome. • Nutcracker syndrome is a vascular compression disorder, referring to the compression of the left renal vein between the SMA and the aorta, with elevation of left renal vein pressure. • The most common clinical presentation of nutracker syndrome is hematuria with or without left flank or abdominal pain. These vague clinical symptoms make diagnosing the disorder difficult. Hematuria with pain is associated with a broad differential, including renal stones, pyelonephritis, glomerulonephritis, trauma, or renal neoplasm. • Nutcracker syndrome typically occurs in relatively thin patients and results in left renal vein hypertension, leading to small venous ruptures in the collecting system, which cause hematuria and proteinuria. • Major potential collateral veins may develop (eg, gonadal, ascending lumbar, adrenal, periureteral veins). In men, reflux from the left renal vein can lead to left-sided testicular pain, varicoceles, or infertility. In women, it can lead to pelvic congestion syndrome, characterized by pelvic pain, genital varices, dysmenorrhea, and dyspareunia. • The gold standard for nutcracker syndrome diagnosis is renal venography combined with a measurement of the renocaval pressure gradient, although there is no consensus on criteria for a clear diagnosis. • Color Doppler ultrasound measurements of the peak flow velocities within the left renal vein are helpful for diagnosing nutcracker syndrome. Doppler ultrasound also is specific but not as sensitive as CT or MRI because of the lack of anatomic information. • CT and CT angiography (as well as MRI and MR angiography) can demonstrate compression of the left renal vein in the aortomesenteric angle and the presence of collateral veins. • Nutcracker syndrome treatment is determined based on the severity of symptoms. Patients with severe pain can undergo endovascular left renal vein stent placement or left renal vein transposition. If pain is tolerable and there are no other complications, patients can choose observation as treatment. — Krishna Patel is a fourth-year medical student at the University of Connecticut School of Medicine. — Alex Merkulov, MD, is the section head for women's imaging and an assistant professor of radiology at the University of Connecticut Health Center. Eliahou R, Sosna J, Bloom AI. Between a rock and a hard place: clinical and imaging features of vascular compression syndromes. Radiographics. 2012;32(1):E33-E49. Venkatachalam S, Bumpus K, Kapadia SR, Gray B, Lynden S, Shishehbor MH. The nutcracker syndrome. Ann Vasc Surg. 2011;25(8):1154-1164.